While live plants provide a more natural habitat for fish, artificial plants have their own benefits which are listed below. • There is a great variety of artificial plants available on the market. They come in different sizes, colors and shapes, so the final design of your aquarium is only limited by your imagination. • Artificial plants are maintenance free. They don't require special lightning, substrates, supplements, and pruning. The same artificial plants can be used in both fresh and saltwater tanks. You can choose any plant you like and place it anywhere your wish. If you don't like its placement, just move it to a new location. Once you buy the plants, you will never have to spend money on them again, unless you decide to purchase new ones. Yes, it's simple as that! • A lot of modern artificial plants are made of flexible and silky materials; they move with the water and look pretty much organic, especially after they've accumulated a natural lining of algae. • Artificial plants are ready to use. You can place them in your aquarium as soon as the plants arrive, while live plants need some time to grow and blossom. Before you place any plastic plant in your tank, remember to give it a quick rinse in clean water to remove any contaminants. If you want fabric plants to look more realistic, soak them in warm water for about 30 minutes before you place them in the tank. This helps soften the fabric. • Artificial plants are very easy to clean. You just need to remove them and rinse them off. Alternatively, you can soak them in a cleaner designed for plastic aquarium plants. • Artificial plants don't decay and don't die, so they don't cause unwanted changes to the water. 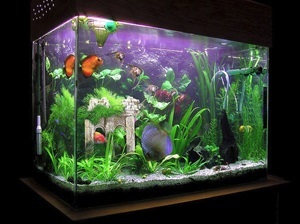 • Their look won't deteriorate over time because of the fish trying to eat the plants. • When you add new artificial plants to your aquarium, there is no risk to introduce foreign, harmful pests or parasites. • Artificial plants don't add oxygen and carbon dioxide to the water, so they don't affect the water quality. You won't have to monitor water conditions closely like it should be done with live plants. • Artificial plants are a very good choice for beginners who don't yet know how to properly care for live plants.